Debbie Bowman created Australian Olympic history in her chosen sport of hockey. 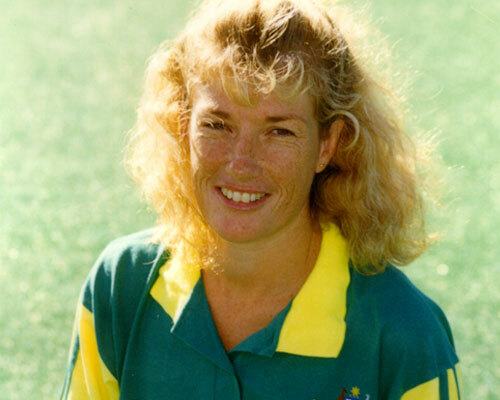 As captain, she led the Australian Womens team to Olympic gold in Seoul in 1988. Amazingly the feat was Australia's first ever Olympic gold medal in any teams event. Debbie began to play hockey from the age of seven and it wasn't long before her coaches realised that she was born a leader. She was chosen as captain of her local school teams at Musgrave Park and Keebra Park High. At the 1976 State Championships she was named in the best 13 and so began 16 years of representative Hockey. Debbie continued her state representation at junior level over the next 4 years and in 1980 broke into the senior ranks. At the age of 16 Debbie was the youngest player ever to make a state senior team. She was selected in the Australian Womens Squad in 1984, and in 1985 a compulsory move to the Australian Institute of Sport led to Debbie being selected in her first senior National Team. In her debut year she played international matches against West Germany, England and Scotland. After just 12 months her leadership qualities again came to the fore and at 21 years of age she was named captain, the youngest ever to lead an Australian team. In the following year Debbie achieved the most fulfilling highlight of her illustrious career by leading Australia to Olympic gold at the Seoul Olympics. Debbie had a number of injuries which needed extended attention and rest, and at the time were serious enough to force her into retirement. But 2 years later the need to challenge herself was too much, and she was once again back playing at the highest level. Just a year from 1992 Barcelona Olympics Debbie suffered a major blow when she dislocated her shoulder during the Champions Trophy in Berlin. But a quick recovery saw her back in the Australian team and ready for the Olympics. The Australian Team's achievement at the Barcelona was far different from that of Seoul. The Aussies failed to fire and inconsistent performances saw them eliminated in the quarter finals - not a fitting way for Debbie to end her representative career. Debbie began a coaching career with the Queensland Academy of Sport and at the time of writing is heavily involved in hockey on the Gold Coast and has achieved her level 3 coaching accreditation.